Bats are very placid and shy animals with tiny teeth. However, a stressed or injured bat might be grumpy (as we would be!) so please take these precautions to avoid being bitten: As with any wild animal, please use gloves if you need to pick up an injured bat. Sometimes it is easier to lift a bat by wearing gloves and then using a tea-towel or soft cloth, gently placed over the bat. They have a strong grip so a very gentle wiggle can help the bat to release its toes. Healthy bats can usually take off from the ground, so if you see one on the floor or in an exposed place, it probably needs your help. Place a soft cloth or some kitchen paper into a small, secure box or pet carrier (with small air holes). Place the bat inside (see Handling bats above) and put the lid on. Provide a small dish of water – no bigger than a plastic milk bottle lid – for the bat to drink from. Keep in a warm, safe, quiet place until help arrives. Sometimes bats just get exhausted and need time to build up strength. A carer will feed and monitor the bat, before returning to the location for release. 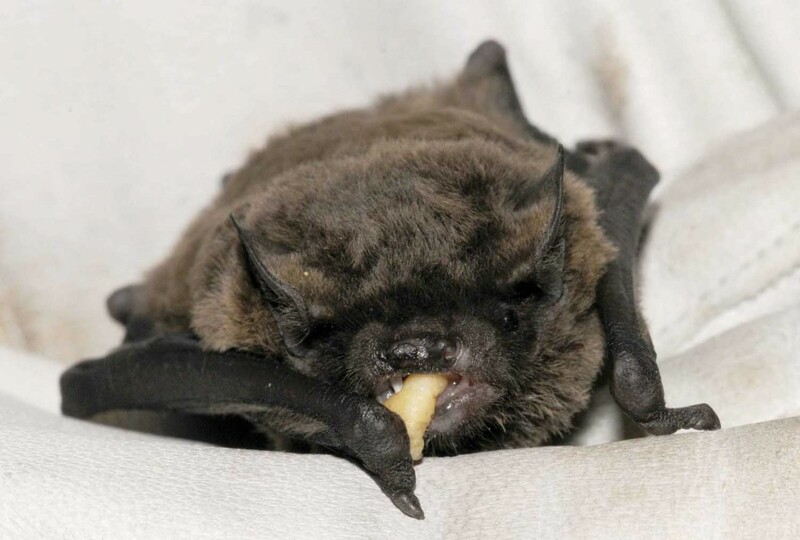 Bats can recover from small wing tears and minor injuries, but need fast treatment. Many injuries are caused by cats. Bacteria from a cat’s claws can cause fatal infections, so even tiny wounds need antibiotic treatment as soon as possible. It is best not to just leave the bat for a few days and see how it does – sadly this will just give the bacteria more time to kill the bat. If you can, place the bat in a box (as above) and call for help. Most people are surprised just how small British bats are. An adult pipistrelle (our smallest bat) weighs less than a 2 pence coin and measures just 5 cm long! Babies are born in June and July, pink and hairless. As they grow, they develop a fur like ‘peach-fuzz’ before getting their adult coat. If your blow gently on the fur and it parts, then the bat is probably not very young. If you are certain you have found a baby bat, please get help as soon as you can. A baby will need to be kept warm so place it in the same box as suggested in ‘Grounded bats’ above, but without the water, and place the whole box on top of a hot-water bottle. Never let a hot-water bottle get in direct contact with a bat! An experienced carer will need to hand-rear any orphans. This is a very specialised job and should never be taken on by a well-meaning yet inexperienced person. Bats are excellent fliers but occasionally take a wrong turn! A flying bat in a house is looking for a way out. If it is dark, open any doors and windows as widely as possible. Tie up curtains to make a clear exit. Turn off the lights and close the door to the room where the bat is. You will have to wait a while, but the bat should fly out of its own accord. Never try to catch a flying bat. It is likely to become injured and you risk being bitten in self-defence. Bats become ‘torpid’ during the day. They slow down their breathing and heart rate and reduce their body temperature. They are sluggish if woken up and need about ten minutes of shivering to warm up. A torpid bat feels cold to the touch – but it is not dead! Watch carefully for tiny ear-wiggles to check that the bat is alive. Never force a torpid bat to warm e.g. under a lamp.Follow the advice above for ‘Handling bats’ and ‘Grounded bats’, then call for help. Please refer to the contacts section for more advice or to contact a bat carer. If you regularly find bats in your house, you might have a roost. If this is a problem, BCT can arrange for someone to visit you for help and advice. Remember it is illegal to damage a bat roost, but there are legal ways to solve bat problems, so always ask. If you do have a roost – congratulations! You are providing a much needed home for some beautiful and sensitive creatures. Why not do your bit for conservation and record their numbers once a year in the Colony Count.